« Mustache “Stache Bash” Party Confetti- 2 oz. 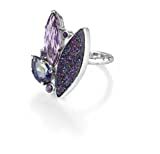 arge blue drusy gemstone mounted in .925 sterling silver surrounded by an amethyst gemstone, mystic fire quartz and three small iolite gemstones all atop a sterling silver ring band. This entry was posted on Saturday, January 11th, 2014 at 9:15 pm	and is filed under Pizzazz. You can follow any responses to this entry through the RSS 2.0 feed. You can leave a response, or trackback from your own site.